The new roads consist of a 3km (1.9 miles) section north of Box Hill, and a 10km (6.5 miles) climbing section south of Box Hill. That’s quite a bit of new tarmac on a course like London! In fact, this update will expand London’s roads by approximately 30%. Once released, the southern section will be the biggest climb on the London course, with 243 meters (796′) of elevation gain over 6km (3.7 miles) for an average gradient of 4%. The backside of the climb is 4.5km (2.8 miles) long with a -4.9% grade. 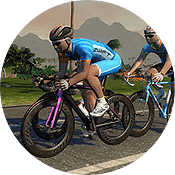 This new climb is Zwift’s version of Surrey’s famous Leith Hill, with the backside of the climb (visible in Eric Min’s screenshot) called “Keith Hill” in game. By comparison, the Box Hill climb currently in game is 2.7km (1.7 miles) long with 139 meters (456′) of elevation gain for an average gradient of 4.9%. Until the expansion is released, we won’t know what new pre-planned routes will be available using the new roads. But I’m sure we’ll have at least a handful of new routes, which will make group rides and races much more interesting in London since we’ll have a variety of climbs to work with. 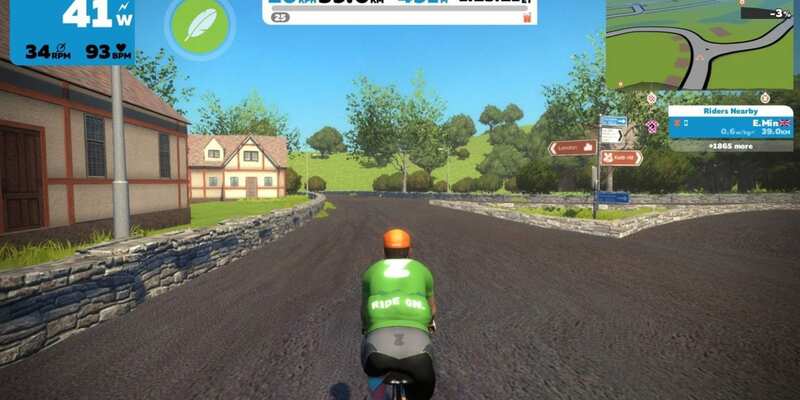 As always, Zwift hasn’t promised a release date for the London expansion. But my guess is it will arrive when we all return to London Tuesday, January 9th. Adding more climbing is always good. Agreed the downside of this map was no longer climb option. They kept the average gradient about the same which is fine with me. Looking forward to it! I know a lot of people complain about the London map, but I personally love it and can’t wait to have a crack at Leith and Keith! All new roads are good roads. If it’s as good as Leith Hill we’re in for a treat. Shame it’s the dull London map, but it was the right place to put it. London will be far more enticing now that it has something interesting to tackle. A decent effort until/if we get a properly big, consistent climb in Zwift. If they want to earnestly appease climbers then they need to take something like the Stelvio and draw in beautiful lush foliage around the bottom, then make it increasingly stormier nearer the top. Ferocious rain, hail and wind for the last few kms. That would be immense. Should unlock a special kit/bike for successful completions. Climbs are great, but it seems to me the vast majority of people stick to the flats. Last night 2,400 people on and maybe a couple dozen in the Alps and THREE on the tower climb. Those three (you me and the other guy) are maybe zwifts biggest fans and promoters, the ones that post comments on the articles, so they need to keep us happy. But the reality is most people stay on the moderate routes. Besides, a watt is a watt, why do you want to watch terrain going by slowly? Cheers. I do not know why, but I like Richmond more. Maybe you’ll like London now. Good news, more roads, always a big plus. Has anyone seen that there are already a few Strava segments set up for the new parts of London. As only Eric Min has ridden it according to Strava, it must be either him or someone at Zwift who has created them. The names are quite amusing/revealing: “Price Hike Loop” (so that’s where our subscription increases are going! ), “Southwark. Not very intens.” (poking fun at THAT Watopia segment name), “Zwift Velodrome: Coming soon here” (interesting?) 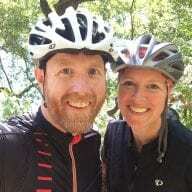 and finally “Corner sponsored by Zwift Network News” (surely ZwiftInsider should get in on this first!). Methinks those were created by the silly folks at ZNN (https://twitter.com/ZwiftNews). You can actually download Eric Min’s files, upload them to your Strava account, then create segments from them. Once the course is released and I can create accurate segments I’ll do so! 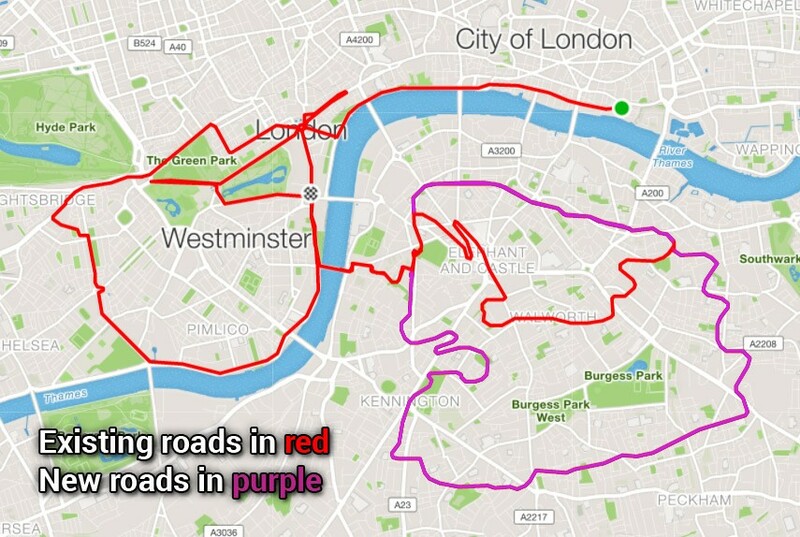 Minor nit – you have the road from the tube station to the existing Box hill route marked in purple. That little bit ought to be in red, I think. The junctions for these new routes have been visible on the minimap in game for quite a while. I don’t mean like the jungle route where everyone is just assuming the cones are where they will connect a new route – but rather the turn offs already appear as real roads on the minimap. BTW: Love HILLS! Leith/Keith Hill will be nice. A GREAT name by the way to call it.